Microsoft has released the first service pack (SP1) for Microsoft Visual Studio 2010, an Integrated Development Environment (IDE) which aids developers and programmers to develop console and graphical user interface (GUI) applications along with Windows Forms applications, web sites, web applications, and web services in both native code together with managed code for all platforms supported by Windows OS, Windows Mobile, Windows CE, .NET Framework, .NET Compact Framework and Microsoft Silverlight. Help Viewer 1.1 – Quick access menu bar icons; Search locally installed content; Search for matching strings within topic; Console views (TOC, Index, Favorite, and Results from Search); Shortcut menus; Content window Print topic; Options: Change display font size, number of topics in history, and which side the console view is displayed on. Includes Microsoft Silverlight 4 Tools for Visual Studio 2010 for targeting Silverlight 4 in the Silverlight designer and project system. IntelliTrace for 64-bit and SharePoint. Software rendering is enabled on Windows XP and on Windows Server 2003 to help improve the performance and stability of Visual Studio 2010. Support using of Internet Information Services (IIS) 7.5 Express as the local hosting server for the website and Web Application Projects. Support managing Microsoft SQL Server Compact 4.0 SDF files in Solution Explorer and in Server Explorer in the context of web projects. Support the new Razor syntax used by ASP.NET Web Pages and by ASP.NET MVC 3. Include WCF RIA Services V1 SP1. MFC-based GPU-accelerated graphics and animations. New AMD and Intel instruction set support. The Visual Studio 2010 Service Pack 1 (SP1) will upgrade all editions and languages of Visual Studio 2010 that is installed on the system, including Express, Professional, Premium, Ultimate and Test Professional editions. If you install any other editions or languages of Visual Studio 2010 after SP1, SP1 must be reapplied. Visual Studio 2010 SP1 can be downloaded from Microsoft Download Center. 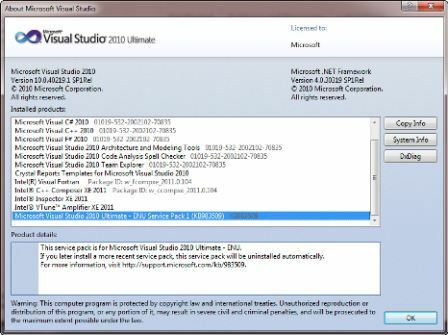 For more information on the SP1 for Visual Studio 2010, check out the Read Me document. A side note is that the SP1 is not meant for users who are installing stand-alone ‘Microsoft Windows SDK for Windows 7 and .NET Framework 4 (Windows SDK v7.1)’ and are using x64 or IA64 compilers that were included in that download.